The Project Oriented Environmental Management System (POEMS) provides a robust methodology for the environmental management of equipment, platforms and services during their lifecycle. 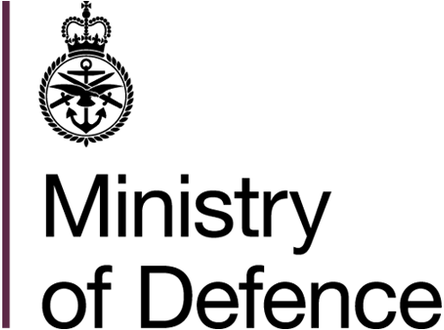 The key aim of the POEMS is to enable MOD acquisition teams to eliminate or minimise adverse environmental impacts whilst exploiting positive impacts, within the acqusition cycle. The POEMS enables projects to discharge their delegated responsibilities and satisfy the requirements defined in Legislation, Departmental Policy and Domain-specific Defence Regulations. The POEMS reflects the principles of ISO14001, allowing effective read across for industry. The POEMS performs a crucial role in ensuring that the MOD meets its sustainable development and sustainable procurement goals. Equally, sustainable development and sustainable procurement activity will enhance the POEMS activities. For example, the outputs of a POEMS assessment undertaken during the “Concept” lifecycle stage can inform sustainable procurement activity and consequently eliminate or reduce anticipated environmental impacts within the procurement cycle (targeted contract management and enhanced design options etc.). The POEMS highlights the importance of identifying and consulting with stakeholders and Subject Matter Experts (SMEs) so that projects can effectively discharge their delegated responsibilities. The scope of the POEMS is limited to acquisition and support projects for equipment, platforms and services. The POEMS does not seek to directly manage operational use of equipment as this is the responsibility of the relevant service. However, the output of the POEMS will inform the operational communities’ management of the environmental impacts arising from equipment use, and any operational mitigation that should be implemented. The POEMS is designed to encourage a proportional response to the size, complexity and environmental challenge of projects. It follows the rationale of CADMID and is aligned with existing equipment safety management practices and procedures, where practicable. The assessment elements of the POEMS have also been developed to be consistent with current processes and procedures operated elsewhere within the Ministry of Defence (MOD). There has been a major uplift from the Acquisition System Guidance (ASG) to online version. POEMS has undergone major revision. Refer to the POEMS Transition Document for details. Selecting any number of terms from the various taxonomies below will filter down the content of this page to those entities which have been classified with the specified term using the appropriate taxonomy. Once selected, the taxonomy term will be added to the Active Filters list. Selecting a taxonomy on the active filters list will disable that filter. A fully resourced plan to manage potential impacts to the environment should be developed. It is likely that aspects will be known to the project team prior to commencement of the POEMS Process. This procedure should allow the project team to budget, resource tasks that may be required to assess the significance of the impacts from the project and to demonstrate that any significant impacts are minimised or reduced, as far as reasonably practicable. This procedure will enable the project team to ensure that environmental issues are appropriately managed, with all environmental responsibilities communicated. EMP02 will assist the project team in identifying stakeholders, define and agree project environmental responsibilities, produce an effective communication plan and assemble an environmental committee. It is important to identify environmental standards that apply to projects in order to demonstrate compliance. This procedure better enables project teams to identify relevant environmental standards and requirements, understanding how compliance is achieved and how compliance arguments should be built and recorded. 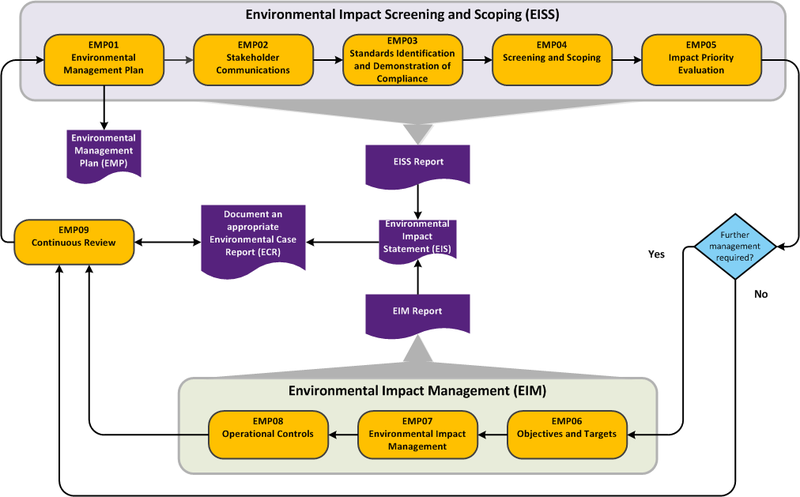 This procedure describes how to carry out a screening and scoping exercise that identifies the project’s actual and potential environmental issues and directs the gathering of relevant environmental information for assessment later in the project level Environmental Management System. The procedure provides guidance on how to assess the priority for managing the environmental impact. The aim of this procedure is to assign all the identified impacts to a priority of Low, Medium or High. This will determine which risks and impacts deserve further consideration. Setting objectives and targets are vital in helping to maintain environmental performance and drive continuous improvement. This procedure should help project teams identify objectives and targets related to impacts or aspects assessed as medium or high priority. This procedure focuses on the management and reporting of high and medium priority environmental impacts associated with the project. An operational control exists to ensure an activity is completed in the correct/desired way. This procedure should assist project teams in identifying where operational controls are required and checking the adequacy of operational controls.